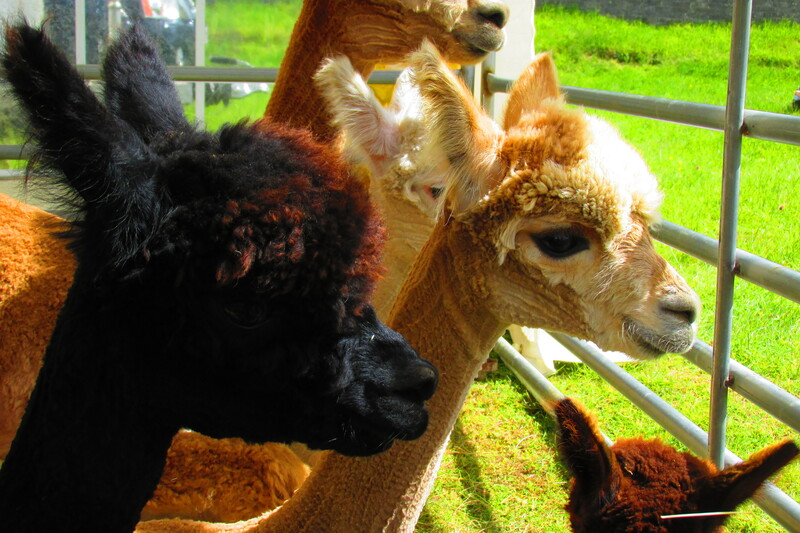 Alpacas and Dragons and Sheep, Oh My! 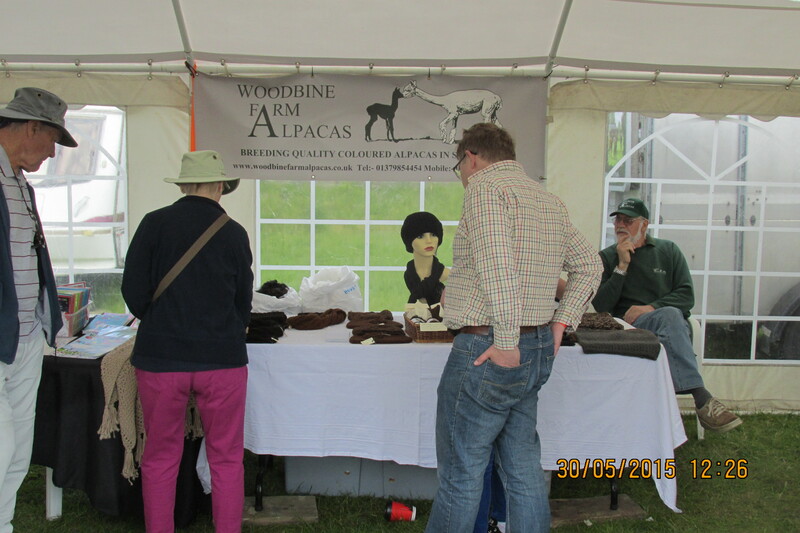 Ickworth House, a National Trust property in Suffolk, held their second Wool Fair at the end of May. I went along because my IDC teacher/assessor Helen Jordan asked if I might, on the off chance, be up for helping with her crochet supplies stall Thread of Life. I had just handed in my household project and the request came when the project was returned to me. I didn’t immediately agree, as I’m not really a “Roll up! Roll up! Come and see this…” kinda gal and thought that this, combined with my rubbish maths, wouldn’t make for a good stall companion! Helen said it was fine, and that I could sit and do demonstrations. The magic words were “all expenses paid!” Well, I thought, why not?? It would be a good, if slightly daunting, experience for me and, although a stall companion isn’t essential, it is handy to have someone to mind the stall during a break as well as to help with setting up/deconstructing a stall, and hefting things about. The event came around, and the forecast was for a lovely bright Saturday, followed by a wash-out the next day (did someone say Sunday?). 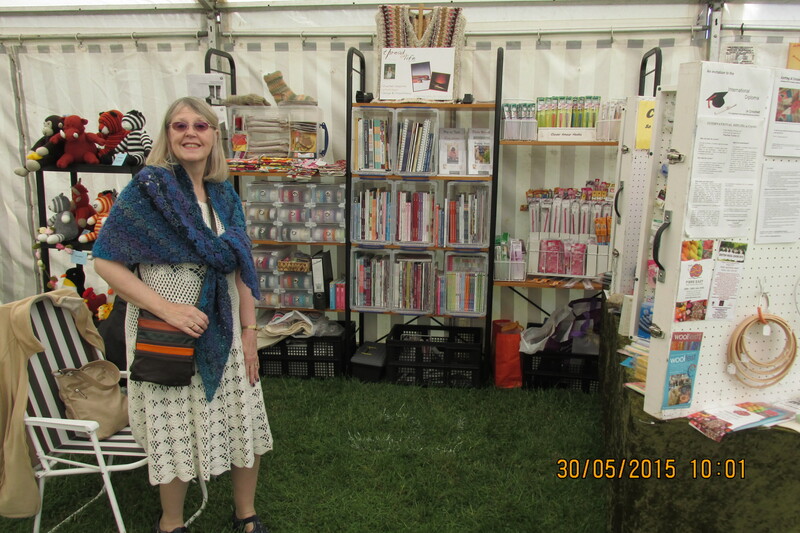 We were situated in a big marquee – less likely to get blown away than the individual tents (this did happen to someone the night before the event!) The weather matched the forecast but the rain didn’t put the public off, as I think there were nearly as many visitors as on the sunny day. To calm my nerves, I sat and did demonstrations for much of the day (mostly of hairpin crochet, with a bit of tunisian thrown in), The hairpin really piqued people’s curiosity and I was asked about it lots. I explained it wasn’t new-fangled technique dating to at least Victorian times but, for some reason, had never become widely used. I showed how it could be used to create intricate and delicate shawls but also to produce denser fabrics. It uses less yarn than ordinary crochet, and works up quickly, which is great if you’re an impatient beginner! Most of those stopping by the stall didn’t know what hairpin was, though some had heard of it; only one elderly lady knew exactly what it was. She told me her grandmother had used this technique but that she hadn’t seen it in a long time. I found out she had taught a bit of crochet so I encouraged her to teach this method of crochet which deserves to be more widely known. Another fascinating conversation sparked off by the hairpin was with a Textiles graduate. From a distance, she seemed totally entranced by what I was doing, before coming to talk to me. Turns out she had tried her hand at most textile crafts but had never encountered hairpin. Not that she got on with crochet at all – apparently, the constant motion of slightly flicking the wrist in crochet wreaked havoc with her neck. My comments about hairpin being an old technique in a relatively young craft surprised her as she believed crochet to be older than knitting, which is ages-old. (Pauline Turner of the International Diploma in Crochet teaches that there is no solid evidence of the craft prior to the 1800s.) The graduate’s eyebrows rocketed! This all lead on to her telling us about her studies, and her dissertation which revolved around the idea of the invisibility of “women’s work” – the cooking and cleaning and clothing – which enabled men to get on in life. Her husband was nearby and smiled at the irony – while his wife studied, it was he who did the housework… much better with the Dyson than she was, in fact! Not content with a Textiles degree, this crafter is going on to do a Masters in Fine Art – no easy thing when the emphasis is textiles. I remember something Grayson Perry said about craft not being valued as highly as art, and how it was more difficult to “come out’ as a crafter than as a transvestite”! Let’s hope this woman manages to shake up the status quo! 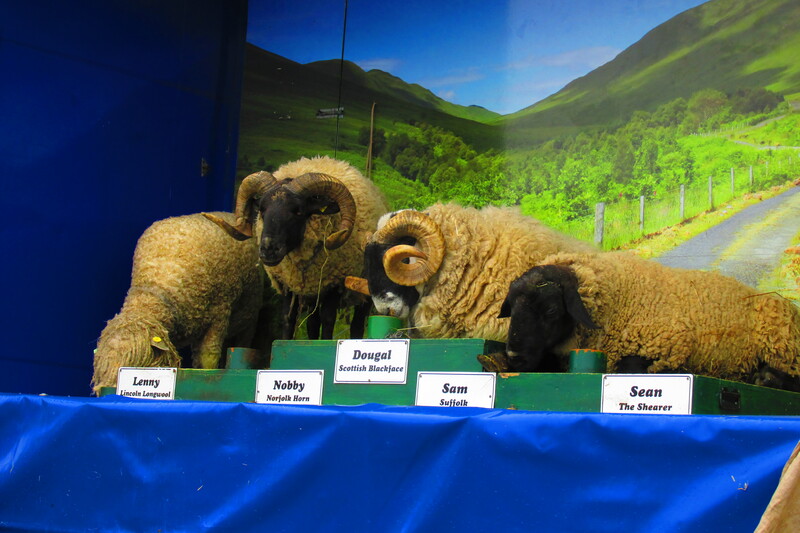 Rare Breed Sheep.. before the music started..
Rivals for the attention of the public were the (non-dancing) alpacas. They are lovely creatures belonging to the camel family – think camels without humps. Mind you, I’ve tended to think of them as long-legged sheep with elongated necks. But don’t you dare call their fleece wool! For some reason it’s called fibre. Unlike wool, it is hollow in structure, and the absence of lanolin makes it hypoallergenic. There are two types of alpaca based on differences in their fibre: the Huacaya have sheep-esque woolliness; the Suri have long,spiral locks.These camelids are friendly with sheep, goats and chickens and can be kept alongside them. Handily for the chickens, they offer great protection against foxes. But if you’re thinking of keeping a guard-alpaca, do remember that they are herd animals and must be kept on groups of at least three. Not that they’ll vocalise aggressively; they don’t even brazenly bleat like sheep or goats. It’s almost as if they’re ventriloquists, throwing their voices, as the sound doesn’t quite seem to come from them. I now understand why it’s described as “humming”.. The dragons were of the non-maiden-eating type. 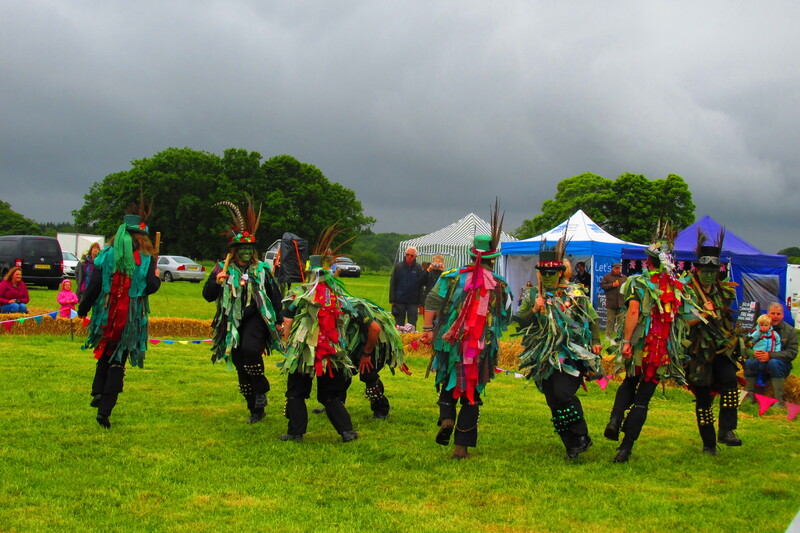 They jingled a bit, they skipped a bit, for these were the Green Dragon Morris Dancers, a “family side” meaning that women are allowed to participate. Other delights included a sheepdog trial which I, unfortunately, missed, and non-woolly stalls such as the Suffolk Wildlife Trust, and Libbidib Pottery. All in all, an enjoyable weekend – and a lesson learned: don’t pass up an opportunity because of self-doubt.